Julia Smith is a postdoctoral fellow in history at Rutgers University, New Brunswick. Ahmed White, The Last Great Strike: Little Steel, the CIO, and the Struggle for Labor Rights in New Deal America (Berkeley, CA: University of California Press, 2016), 416 pages, $29.95, paperback. It should come as no surprise that mainstream media largely ignored these events. The withdrawal of labor, whether free or unfree, on such a massive scale remains one of the most powerful weapons working people can wield in their struggles for equality and justice. Highlighting instances in which workers, past and present, have walked off the job, staged sit-ins, or shut down production is thus a profoundly political act. The Last Great Strike, by legal scholar Ahmed White, prompts readers to consider the strengths and limitations of mass strikes and state intervention in labor relations, by revisiting an era that saw much of both in the United States. In great detail, the book narrates and analyzes the Little Steel Strike that occurred in the summer of 1937, when thousands of steel workers organized with the Steel Workers Organizing Committee (SWOC) of the Committee for Industrial Organization (CIO; later the Congress of Industrial Organizations) in several states walked off their jobs at Republic Steel Corporation, Bethlehem Steel Corporation, Youngstown Sheet and Tube Company, and Inland Steel Company. These companies were collectively referred to as “Little Steel” to differentiate them from “Big Steel”—the mammoth U.S. Steel Corporation. One of the landmark strikes in U.S. history, at its peak it involved more than 80,000 workers. The central argument of White’s deeply researched and vividly narrated book is that the scale, violence, and significance of the Little Steel Strike made it the “last great strike” of the early twentieth century, a period marked by an “unprecedented outbreak of economic crisis, class conflict, and political struggle” (6). Challenging earlier accounts of the strike that viewed it as either a failure or “a brief setback in a journey from defeat to victory” for labor, White contends that the strike was “a clear revelation of the contradictory course that labor rights, class politics, and political economy would take through a key period in American history” (6–7). The book opens with a chilling description of one of the strike’s key events, the Memorial Day Massacre. 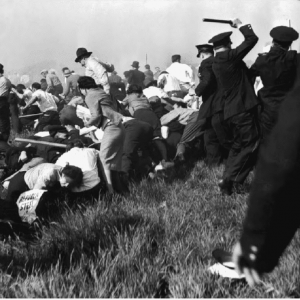 On May 30, 1937, police attacked demonstrators outside a Chicago steel mill, killing several people and injuring many more. 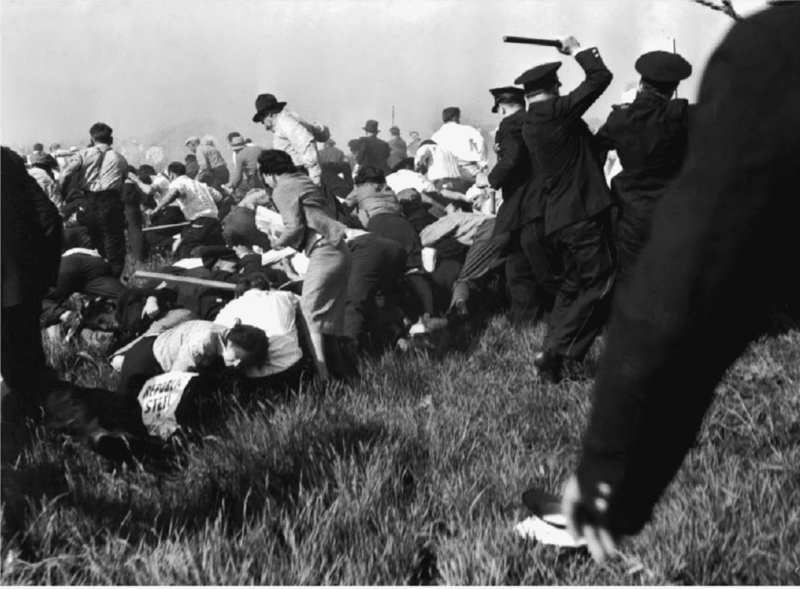 Although the massacre was an important event in the Little Steel Strike and in U.S. labor history, White points out that most studies of the strike have focused solely on the events of May 30, to the exclusion of the rest of the strike’s history. When unionists and academics discuss the strike, it is often “misunderstood and its meaning and legacy miscast.” The Little Steel Strike, White argues, was neither a “temporary setback on” industrial unionism’s “march to sweeping victory,” nor “a poorly timed and badly executed gambit” by the unions involved (5). Rather, the strike is “a cautionary tale about class conflict and the limits of labor rights and social reform in liberal society” (9). White sets the stage by examining how the labor process, earlier steel-industry strikes and organizing efforts, and the “changing landscape” of U.S. labor relations shaped the Little Steel Strike. Changes in technology and political economy allowed employers to wrest control of production from employees and to construct “a potent system of labor repression” that hindered unionization in the first two decades of the twentieth century (13). At the same time, craft unions proved unable or unwilling to organize the new industrial workforce; divisions among workers over skills, race, and ethnicity compounded the problem. Dangerous working conditions in the steel plants further strained labor relations and union organizing in the decades leading up to the Little Steel Strike. Though some organizing occurred and thousands of workers participated in the “Great Steel Strike” of 1919, by the 1920s the union presence in the steel industry was significantly diminished. The Depression worsened matters, as poverty and high unemployment put a further damper on organizing. Meanwhile, the steel companies had developed several methods of labor repression. In the 1930s, they used violence, intimidation, and political maneuvering to hinder organizing efforts by the SWOC and the CIO and to oppose the new labor regulations introduced under President Roosevelt’s New Deal. Despite these obstacles, a new wave of organizing swept the steel industry in the 1930s in response to the New Deal and “the emergence from below of a coalition of workers and activists determined to harness workers’ discontent and government reforms to an effort to unionize the industrial workforce” (69). The result was “one of the most remarkable organizing drives of the 1930s” (85). The union’s success in recruiting black workers as both members and organizers was especially significant. Facing discrimination from employers and unions, African American workers had long been relegated to the industry’s worst jobs and excluded from union drives. The SWOC’s ability to organize black workers was due, in part, to the involvement of organizers with links to the Communist Party and the United Mineworkers of America, organizations with stronger track records on race. White’s account of the events leading up to the walkout reveals the uncertainty and doubt that plagued both employers and union leaders in the days and weeks preceding the strike. In discussing the Memorial Day Massacre, he pays particular attention to a piece of newsreel footage showing the violent confrontations between police and protestors; he argues that the film remains “perhaps the single most compelling visual depiction of class conflict in American history” (141). The book then turns to the subsequent clashes between employers and workers as the two sides battled to control access to the steel mills. For White, such conflicts “give further support to the view that, although chaotic and confused, the violence that characterized the Little Steel Strike was seldom random or irrational” (166). As the strike continued into June and July, a worker victory looked less and less likely. White contends that “the very acts of militancy that were so crucial to sustaining the picket lines and keeping the plants closed hurt the unionists’ cause in other ways,” as the steel companies exploited any incident of violence to justify state intervention (181). White concludes by considering the reasons for the strike’s failure and the events that followed, including the lengthy legal proceedings. In detailing the multiple factors that undermined the strike, White shows the political and tactical complexity of mass strikes and the many actors and interests at play. He argues that the companies’ economic power, “maneuverings in the fields of politics, law, and public relations,” and use of violence and repression contributed to their victory (229). Meanwhile, poor strategy by union leaders and outbreaks of violence among radical unionists and rank-and-file workers only “played into the companies’ strengths” (229). White also looks at the National Labor Relations Board (NLRB) and its efforts to prosecute Little Steel for multiple violations of the Wagner Act, contending that although the Little Steel cases aided workers in some ways and advanced labor rights in the United States, they exposed “crucial shortcomings” in New Deal labor legislation and the NLRB’s ability to enforce it (261). The strike’s aftermath shaped the steel industry’s efforts to reform the Wagner Act and contributed to the development of a more bureaucratic and conservative steel unionism in the 1940s and beyond. As in many other unions, Communist members were purged. White acknowledges that “without the support of Communist organizers, the SWOC would have stood no chance against Little Steel and might even have failed to organize U.S. Steel and other firms”; however, he ultimately concludes that “it is unlikely that their presence would have dramatically changed the course of steel unionism” (246, 248). The Last Great Strike is a strong piece of scholarship, rich with archival discoveries. Compelling and accessible, it draws on an impressive range of primary sources, including the records of the Steel Workers Organizing Committee; regional archives in Youngstown, Chicago, and Cleveland; and a variety of newspapers and government documents. White also uses existing secondary sources on the steel industry and U.S. left and labor history. The Last Great Strike makes an important contribution to our understanding of U.S. labor history, union organizing, and class conflict. It provides a detailed analysis of a significant labor battle, illustrates the complexity of strikes, reveals the power and ruthlessness of employers, and demonstrates the risks of relying on the state to secure justice for working people. In doing so, White reminds us why documenting and studying strikes, past and present, is a crucial part of developing working-class consciousness and devising new strategies for ending inequality and exploitation. As White makes clear, this consciousness is not a fixed entity; it emerges in diverse and unpredictable ways, in response to specific relations and contexts. Whether it manifests in the widespread withdrawal of labor, as in Little Steel plants in the 1930s and the Indian public sector and U.S. prisons last fall, or in the election of a bigoted billionaire, its character and outcomes are never a foregone conclusion. Understanding the many factors that contributed to the former is crucial if we are to resist the latter. ↩Shashank Bengali, “Why Millions of Indian Workers Just Staged One of the Biggest Labor Strikes in History,” Los Angeles Times , September 14, 2016. ↩Max Blau and Emanuella Grinberg, “Why US Inmates Launched a Nationwide Strike,” CNN, October 31, 2016.